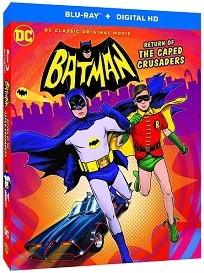 Holy Smokes we’re giving you the chance to return to the 1960’s and win a copy of Batman: Return of the Caped Crusaders, a film which pays homage to the original Batman series. The legendary Adam West is back as Batman and is reunited with Burt Ward’s Robin and Julie Newmar’s iconic Catwoman. The film is available on Digital Download October 24 and will be available on Limited Edition Blu-ray (including exclusive art card), Blu-ray & DVD November 7.